Disclaimer: This article is not an “Email Spoofing 101”. Spoofing examples are presented only for testing and prevention purposes. Of course, such email should not do any harm. If the user2 replies to the message, the email will go to user3, not the attacker. The problem is that after some modifications, Send-MailMessage can send HTML emails with malicious links or attach an infected file. I will not go through examples of how spoofing can be used to harm an organization, but believe me; there are many. Just remember to substitute the IP address with yours. DATA: it enables you to specify subject and body of your email. Enter a full stop (.) in a new line to finish data input. As you can see, the email does not differ from any other message, sent by normal means. It is very easy for the recipient to fall for this trick. As an administrator, you can detect such action in Exchange logs, but in a larger organization with a lot of users and intensive mail flow, it will be troublesome, to say the least. Not to mention that the harm can be done before such an attempt is detected. So why Exchange permits such behavior? And how to block it? This last point is what enables internal users to abuse the mailing system. Unfortunately, turning the permissions for anonymous users off would also block receiving emails from external email addresses. Well, I do not know in what environment that would be a reasonable option. Before I walk you through the configuration process, I will talk about its major drawback. To block internal email spoofing completely using this method, you have to include all IP addresses which are allowed to send emails in your network (this includes printers, applications, and other web objects). This is not the most convenient solution if you have a vast network with loads of various devices. But if you do not have an overwhelming infrastructure and you know it like the back of your hand, the solution should work well. 192.168.23.2 and 192.168.170.79 are the IP addresses of my Exchange Server, while 192.168.169.51 is the IP address of my web printer in another subnetwork. The printer sends emails to Exchange. 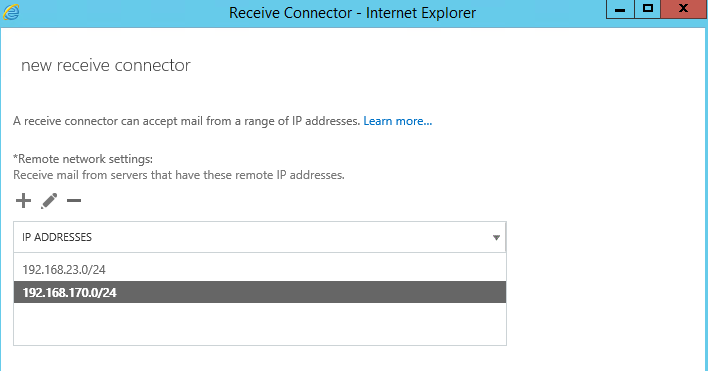 I have to provide two addresses because my Exchange Server has two network interfaces. As you can see, the Exchange server blocks the attempt and displays error 5.7.1 “Sender ID <PRA> Not Permitted. This example shows another drawback of the SPF record method. Because the authentication bases on the sender’s IP, the wrong configuration will not guarantee that your company is completely guarded against internal spoofing. Implementing this method does not influence sending emails from email clients (Outlook, OWA or ActiveSync) because they use RPC or MAPI over HTTP through a different port (443 or 80). 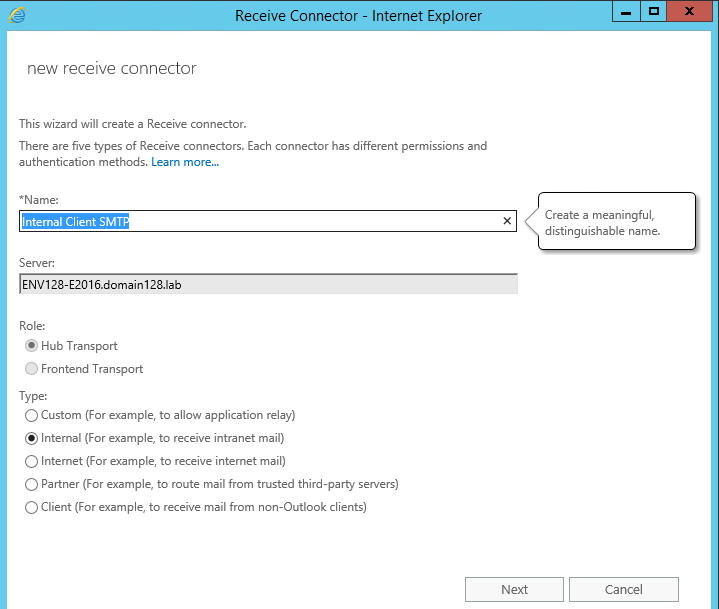 The second method is creating an additional Receive connector on the port 25. The connector controls the local network and lets through only emails from domain users. This approach uses a different authorization method. Instead of using IPs, it uses domain credentials (login and password). The change of the authorization method generates one problem – all internal Exchange connections have to be authorized. In other words, every web device and application which sends emails to Exchange requires a domain account (or, at least, they can have one, common account). As I have mentioned before, the connector will be set for the TCP port 25. But, as you may know, there is already a Receive connector, which accepts anonymous connections from SMTP servers on port 25. So how can this connector coexist with the one you are about to create? And how does Exchange know which one to choose? Exchange Server is quite intelligent when it comes to this. The server will always choose the more precise connector for each connection. The Receive connector I configure is defined for LAN networks, while the default one applies to all connections. Hence, for internal SMTP connections, Exchange will always choose the new connector, specified for LAN. The settings are analogical to those used in the cmdlet above. The connector should be internal, and the role should be set to Frontend Transport… Unfortunately, the default Role is Hub Transport, and it seems I cannot change it to the option I need. Let us go on and see what happens, anyway. The next page is very important – that is where you have to specify all LAN networks you have in your organization. In my case, it is 192.168.23.0/24 and 192.168.170.0/24. That is where Exchange throws an error. 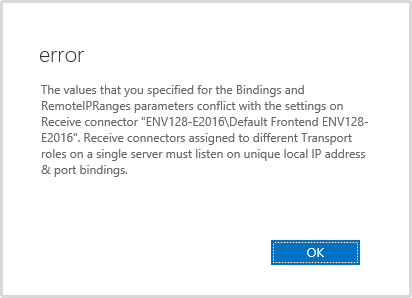 The values that you specified for the Bindings and RemoteIPRanges parameters conflict with the settings on Receive connector “ENV128-E2016\Default Frontend ENV128-E2016”. Receive connectors assigned to different Transport roles on a single server must listen on unique local IP address & port bindings. It seems that Exchange does not like having two connectors with different Transport roles listening to the same port. But the two roles are different only because an option was grayed out… Which is peculiar, considering the fact that a single cmdlet did not throw any errors. You can check if you encounter the same bug, but my advice is to just go with the PowerShell. Now for the testing. 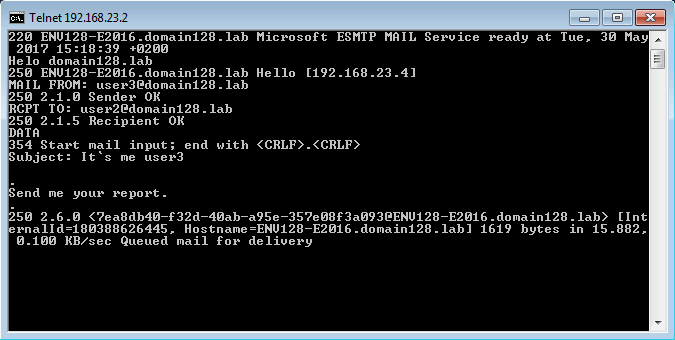 user1 will try to send a message to user2@domain128.lab as user3@domain128.lab. The PowerShell command already used a couple of times in this article does not send an email this time. The error code is different from the one which appeared using the previous method: 5.7.60 SMTP; Client does not have permission to send as this sender. Ok, what if the user tries the same trick after providing his/her credentials? As an Exchange Server administrator, you have to be aware that the default Exchange deployment is not enough to protect your users from malicious emails. Fortunately, you can use this guide to prevent internal email spoofing once and for all. Both methods is based on native Exchange mechanisms, all you need is a little effort. Great Document. Thank you for your sharing man. Its saved my life… God bless you. Im assuming “internal” means inside my domain, why would i not want to allow someone inside my domain to be able to spoof someone else inside my domain? It is very useful to allow “internal” spoofing for applications to send email on behalf of our domain users to other of our domain users. Cant see any internal threat that would be worth losing this. You wouldn’t like to get an email from CEO, stating “You’re fired”, would you? Even if you don’t believe it, would you ignore it? Or how about “drop by my Office in a few minutes”? In some companies that sort of thing is not limited to April Fools’ Day. “Sending on behalf” is another story – in those cases, you can immediately see that the message is sent by someone (or something) else. 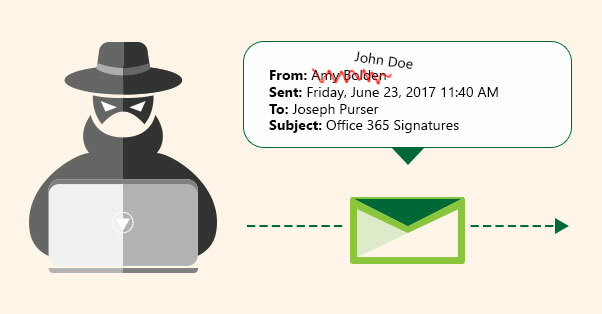 Internal email spoofing does not require any impersonation rights and is hard to trace – that is why some organizations might want to prevent it. Is it possible reject invalid helo in exchange ? Could you explain what you mean by invalid helo? As far as I know, when you type invalid HELO command, you will not connect to anything. What I don’t understand is how you can send a spoofed internal email this way without Exchange blocking the sender as not having permissions to ‘Send As’ that user. Why does the system not detect this basic security breach? 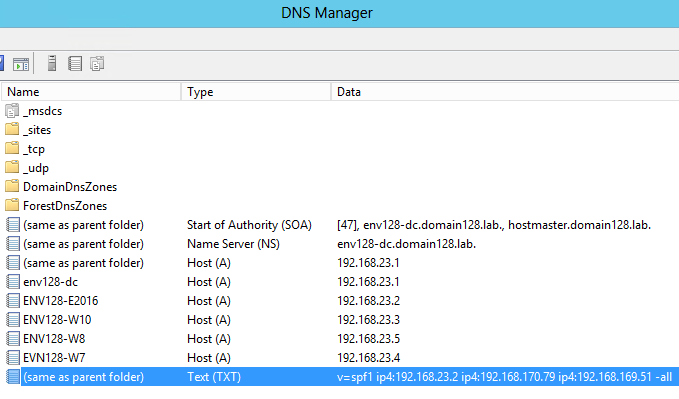 Are you able to provide support for evaluating the current smtp send/receive connectors of a global 2013 deployment? Do you mean you would like me to help with configuration of the SMTP connectors so that they do not allow internal spoofing? I think it would be best and safest if you follow the steps from the article. Then, you should be able to evaluate your connectors’ settings by trying the telnet spoofing method yourself. If you encounter problems at any part of the configuration, please specify at which point and I will try to help. If you have an SMTP Gateway can you simply amend the Default FrontEnd connector to only accept from specific Remote IP Addresses (SMTP Gateway, and any internal SMTP devices). You can leave Anonymous checked, but shouldn’t be able to masquerade as another user? Great article.just need to know how can you prohibit someone outside your network to telnet port 25 and act as your user ? I mean on exchange level. As I state at the beginning of the article, you can block all external spoofing attempts by configuring the SPF record or deploying the DKIM email authentication. Can you prevent on the server side in Exchange an internal user send out multiple messages to other internal e-mail boxes in an automated fashion? Looks like Mail Gateways protect only mails in-out and out-in into the domain but not in-in! Any recommendation to monitor/restrict internal to internal mail flow (flooding etc? )?